I used frosted rough and ready Shrinky Dinks for this project. On this fridge set, I included the highlights and shadows as shown in the photograph. I also printed out the word "Pyrex" in cute retro font to make dangly bits to be attached with jump rings. I think my letters turned out a bit too big so I'll have to re-do. cut out, punch holes and bake according to the instructions. Remember to use a large enough hole punch because your holes will shrink too. We had so much fun watching these shrink. Mom, Olivia and I all gathered on the kitchen floor in front of the oven and watched as they curled up and flattened back out. Once they were all flattened, we counted down to 30 seconds and pulled them out to cool. The instructions call for you to put something on top of them as they cool for 15 seconds so we used a paper back cookbook that we had handy in the kitchen. Shrinky Dinks can be colored with pens, stamps, colored pencils and some may even be used on an ink jet printer! These are the cutest darn things, I think I'll look for shrinky dink paper (Or some #6 plastic; which is how I made shrinky dinks at a science event some years back), and try to make some once the weather cools some. I hear that you can rough up that #6 plastic with sandpaper and color on it with colored pencils! Wow! Memories flooding back. I'm pretty sure I remember making Care Bear shrinky dinks as a kid! 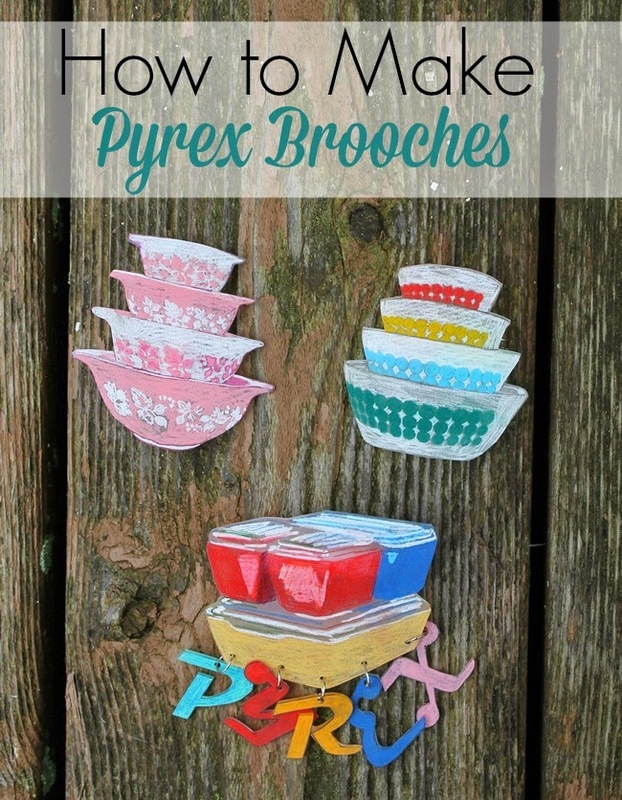 Your Pyrex brooches are adorable and I'm so keen to play with shrinky dinks now! These are great- I love shrinky dinks! These pins are adorable. I've been wanting to make to some shrink art jewelry - I'll have to try this. I agree that that the Pyrex letters are a little big, but I kinda like the look. What lovely brooches :-) I've never actually used shrinky dink paper to make anything, but I think I will now! Ok, that's adorable. I would never have thought to make brooches out of shrinky dinks (actually, to be honest, I don't know that I've ever played with shrinky dinks at all, so novel experience right there), and that's such a fun way to create something that's customized just for you. How splendidly creative! These are off-the-charts adorable! These are just wayyyyy cute!! I love this!! What a great idea! This is THE CUTEST PROJECT EVER. I haven't done shrinky dinks in, well, far too long. And I have a few of these pyrex pieces, so what a way to celebrate them!!! I must make these... and I'm tweeting it now so everyone else can experience the awesomeness of this tutorial. These look great and sound such fun to make! Too dang cute! I particularly love the one with the letter dangles. You know, I don't think I've ever made shrinky dinks... snow day project for this winter, perhaps? After searching the web and or local antique stores a personal favorite of many consumers happens to be the antique cameo brooch auction.